Both Ann and I had a great time last week visiting all the people who had linked up for the first AHIQ linky party. Some were bloggers I already knew, others were new to me; some people were experienced improv quilters, some were having their first go at working like this. I loved the variety of approach and outcome, and the sharing of ideas and thought processes was exactly what we hoped for from AHIQ, so thanks to everyone who posted, and to those who visited and commented on their posts. As we read through it was interesting how quickly a couple of themes emerged, one was (again) the thorny subject of definitions: what is 'proper' improv? Ann will be posting some reflections on this one. The other thread concerned the way we experience working in an improv way. Several people talked about finding it not just fun but also freeing, and there was a great quote from Sandra who wrote improv was "like knowing how to walk and run, and then being allowed to dance..." Who wouldn't want to try something that made you feel like that? From my perspective the whole thing about improv is that it's personal: everyone can, and should feel that it's okay to do their own work for their own reasons. So if what you want is to make something lovely to look at, and that's an end to it, then that's great in my book. My most recent piece of play is just that, play. Nothing more to it. When I stop to think about it, I reckon about half of what I do is just for the fun of it, or because a piece of fabric was so lovely I just had to make a quilt for it, half has more going on. I also have to acknowledge that sometimes, as with my current denim piece, I start off playing but the quilt acquires an extra layer of meaning as I go along. But sometimes improv can be more clearly a medium for exploration and self expression, it can carry an emotional element that isn't always there in other forms of quilting (even if we're not fully aware of it at the time). I notice it most when I make a quilt for someone I love and feel, at the end, that I've got it right, that somehow I've captured something about them, that this quilt could only be for that person. Stephie has made several improv quilts recently (see here) and is explicit about her desire to find a way to capture a specific mood in her work. The feeling of exhilaration when something works and we realise we have said something we needed to say is the upside of this but there can be downsides too. It can feel uncomfortable exposing yourself in this way, putting yourself out there, because the making has become a form of self-discovery and in some cases that means encountering/expressing strong or difficult emotions. I once tried really hard to make a quilt which became the focus of a lot of anger I was carrying. Everything I started just looked wrong, clunky, awkward, ugly and that quilt never got made. But this is all part of the journey (as in life) and just occasionally quilting can equal catharsis. (As I was writing I read this post on expressing grief, which address just this issue). The best summing up of all this I have come across is a quote that Quiltdivajulie has on her sidebar "I am not creating something else, I am revealing who I am." (Catherine Moore) It may not always be pretty, or easy, but it will be interesting and worth the journey. Yes, that's what art is all about, finding your voice, communicating, inspiring. I think I made it around to everyone who linked up. I found all of the posts interesting. This is a very thoughtful and feeling post. great re-cap. It's interesting how different link parties attract different groups. Your group is going to be one of growth. Stephie's ability to convey mood and feelings is one of the reasons I like her quilts so much. It is a special gift that can be learned. As you say, improv is a great place to practice. Thanks for a thoughtful post; much to consider here. I'm sorry that I ended up not able to link up--I have no idea what happened--but I'll catch you on the next round. As for your recap, Oh wow! You have a lovely way with words. It's interesting how you two picked up on the ideas of defining improv and expressing ourselves. Those themes have been the basis of conversations in blogs, books, guilds, and so on. Considering how ever-changing quilting is, these themes will long be a part of our conversations. Thanks, Kaja - that mantra has truly stood the test of time for me, remaining at the center of what I do every time I go into the studio (and most of the time I'm not even aware of its presence). Thanks for sharing another thought-provoking post. Great post. Although I may not do improv quilting at this moment, but your posts are encouraging me to try some improv painting. Thank you for the inspiration. You have shared a lot of meaningful and deep thoughts in this post Kaja. You express things in such a beautiful way. The links you shared are terrific too. 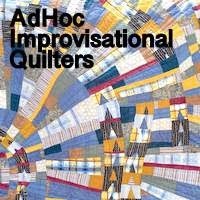 The more intensely personal aspect of improv quilting came as a surprise to me. I am so glad that you and Ann began this group! I was just on Christina's blog, and thought you might like to read what she had to say. It was deeply moving.